The Federal Reserve’s Modern Money Mechanics spells out how money is created. Basically, the U.S. Government exchanges bonds with the Fed for money. The bonds are simply “created”. They reflect debt in that the government promises to pay. So money is founded on debt. When money is deposited, the bank must retain a “fractional reserve” of 10%. Bank loans do not come from money on deposit, because says Modern Money Mechanics, if they did, no new money would be created. What banks do when they make loans is to accept promissory notes in exchange for credits to the borrowers’ transaction accounts. If you watch Zeitgeist 2: Addendum you will see at about 19 minutes into the film that one foreclosure was beaten by the fact that money is created out of nothing: the bank had not given valuable consideration when it entered into the mortgage contract. Perhaps the most discouraging thing I learned from the film is that there is no money in our system to cover Interest charged on loans. Anyone in foreclosure knows that stress can break you. One of the things most harmful to your health is to keep blaming yourself. Read more. One of the best things you can do is help your nerves regenerate by using Methlcobalamin (B12) lozenges. Requests for Production ~ Read more. Nerves v. Foreclosure ~ Read more. 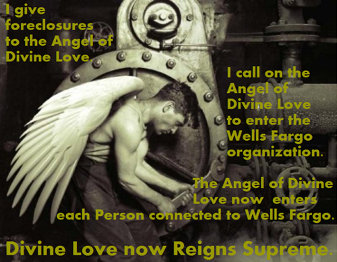 The Angel of Divine Love now enters each person connected to Wells Fargo. Changing consciousness re foreclosures is vital. Banks, to include Wells Fargo and Bank of America, should not feel comfortable denying homeowners due process and using fraud to foreclose. The suicide rate among Americans in foreclosure has gone up 253%. Is that increase a result of bank fraud and deprivation of due process? If so, raising awareness re foreclosures will lower the suicide rate. I say this as someone who tried to kill myself when my condo was foreclosed years ago. The worse part of the foreclosure was the injustice and corruption that I couldn’t do anything about. Not that I didn’t try. That foreclosure resulted from IRS enforcing for a year I’d paid. IRS levied all my money, not leaving enough to buy an apple or a tortilla, despite the fact I repeatedly sent IRS proof that I had paid. Erroneous 1991 Levy for 1984 Taxes ~ Read more. Homeowners in foreclosure are similarly up against injustice and corruption meted out by an adversary far more powerful than them. How so? In most cases the bank has monetized the mortgage note for use in trading, swapping, and derivative profits, which ran into the Billions and more than covered the value of each mortgage. The notes themselves were cumbersome, so banks didn’t keep track of them, or perhaps banks destroyed them to save storage costs. In any case, the UCC requires the original note in a foreclosure action. But how many homeowners are aware of this crucial UCC requirement? And how many courts sua sponte (of it’s own accord, spontaneously) enforced it when the foreclosing bank carefully omits reference to the original note in its foreclosure complaint. How can banks be so powerful that they can ignore the UCC? Think of how Eric Holder, head of the United States Department of Justice, was formerly a Wells Fargo/Big Bank lawyer. Think of how Wells Fargo and the Big Banks have not been prosecuted with anything like a sincere effort to do justice. Being in an unjust situation, and powerless, is extremely stressful. Not only does that kind of stress shorten telomeres at the ends of your nerves, it actually shortens your life, and that’s without suicide. Experts say that suicides among homeowners in foreclosure are a result of feeling shame, hopelessness, and self blame. But, shouldn’t homeowners be blaming banks for fraud and in many cases deprivation of due process? The more helpless you feel, the more you condemn yourself for being unable to do anything, the more you hurt your nerves and let the bank take not only your home, but your health and years of your life. Looking at foreclosure suicides from this perspective you can see the suicides are not without avoidable causes. Augmenting these causes are the news and people who are influenced by the news which blames homeowners exclusively for foreclosure, paying no attention to bank dishonesty, fraud, and denial of Due Process to which homeowners have a right. Calling on The Angel of Divine Love does two things: first, it focuses on something good rather than a horrible, hopeless situation, and second, it counteracts the false impression given by the news, with the result that in actual fact homeowners are less alone and therefore less likely to feel totally hopeless. That said, say the Angel of Divine Love affirmations a few times, periodically throughout the day. If you are in foreclosure, as I am, it helps, and if you are not in foreclosure and are the kind of person who values life, you will be changing consciousness in a way that helps homeowners survive and encourages banks to modify loans and not deprive people of due process. Wells Fargo is once again trying to foreclose my home. This scares me because when Wells Fargo began this foreclosure it did not serve me. I was lucky that I found the foreclosure when I went to Case Lookup to find some dates relating to the foreclosure of my condo, which was done without a hearing although I had answered. Serving a party to a lawsuit is basic due process. It is a Constitutional right, from the 5th Amendment to The United States Constitution. The 5th Amendment is a part of our Bill of Rights. It is also basic due process to have a hearing if someone answers a complaint, but if a court decides not to do that, there’s very little that can be done, especially when only the damaged party objects. Throughout the United States, Wells Fargo and Bank of America use fraud, dishonesty and the denial of the basic constitutional right to due process to make American families being homeless and gain control of their property. The second reason Wells Fargo scares me is that sometime after I discovered the foreclosure it came about that the HAMP, Home Affordable Modification Program, was introduced. I immediately applied. In time Wells Fargo qualified me and sent me an offer to have a trial period. I accepted the offer and sent in my payment on time and in full. This was supposed to ensure my loan modification becoming permanent. But, Wells Fargo went back on its word and began trying harder than ever to foreclose my home. Wells Fargo’s fraud, deceit and dishonesty scares me. It is very stressful to have a bank you trusted be so dishonest. Stress is very bad for nerves and for health, and I already have a lot more pain than I did just a month ago. I will keep fighting the foreclosure of my home because I love my garden. I can’t go out places because I can’t walk very well, so my garden is the love of my life at this point. I love the bees, the wasps, the praying mantis, the lizard, ants, flowers, veggies I have in my meals every day, especially during the summer. Call on the Angel of Divine Love to help all Americans who are up against the huge power of banks that have for all too long gotten away with fraud and dishonesty. And, please will you share this page? The “Workin’ Them Angels” illustration found in the Snakes & Arrows linernotes was created by Hugh Syme with the assistance of George Eastman House, who supplied the original Lewis Hine photograph on which the illustration is based. Read more.